For Promenade, we had to film at 5am in order to capture empty streets in Edinburgh – but of course we had to pick the week the Queen was visiting Edinburgh, painting the streets of the city with a consistent yellow line of policemen in their high-visibilty jackets. And if that was not enough, the worst monsoons were pouring over us at all times. 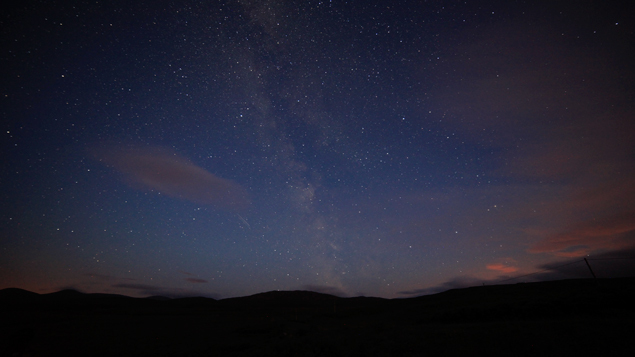 Meanwhile for Dark Skies, we were looking for clear(er) skies at night in order to do some time lapse, not having realised that July is not the month for stargazing because we only have a few hours of darkness…and so we learn! But hey, give me animation any time! No weather conditions or technical problems challenging the process of producing Sweetie and Sunshine. Get a very talented and hardworking animator, and the film is in the bag! At the Scottish Documentary Institute, we endure the belief in the power of storytelling not just to touch and transform individual lives, but hopefully to contribute to international dialogue. As ever, what makes this production special is the team of talent and people behind the films. SDI is a happy home of filmmakers, and we keep attracting new collaborators like bees to honey. We may work long hours, we may not be well paid, but we go home with a fuzzy feeling. Let’s hope it will be shared with our audience.